Aztec farming has become most famous because of the brilliant chinampas system that Aztec farmers used. Certainly there were a number of techniques used in the Aztec empire. But with the great city of Tenochtitlan built on swampy but rich ground, the chinampas became key to the food production of the people. Chinampas were, of course, not just used for the capitol city, but throughout the Valley of Mexico around the lake bed. As the empire grew, more sources of food were required. At times this meant conquering more land, other times it meant expanding the chinampa system. To build the chinampas, plots about 30m by 2.5m were staked out on the lake bed. A fence was woven between the stakes, and the area would be filled in with mud and vegetation. The next rectangle would be parallel to this one, with room for a canal in between, where canoes could pass through. These canals of course offered irrigation, and provided food of their own such as fish and water fowl. Often willows would be planted along the edge of the plot, to provide further stable fencing as well as shade (though they would be carefully pruned to allow enough sunlight into the farm plot). In the end, the garden plot would be no more than a few feet above the level of the lake. They were supported with the Aztec's complex irrigation and waterway systems, which included dams, aqueducts and gates. Farms included crops of maize, beans, and squash. Tomatoes and chilies were also popular crops. But the gardens and particularly the chinampas were used to grow large amounts of flowers, making the Aztec farming land an even more lush and colourful place. There were different types of farmers in central Mexico at this time. You could describe some of them as labourers, and others as specialists. Labourers were of various types, some who basically worked as farm hands or even slaves, others who were responsible for the community farms. (For more on this see this article on Aztec social classes) Specialists (called horticulturalists in Bernardino de Sahagún's General History of the Things of New Spain) would be responsible to know what seeds were the best, how the crop rotation should work, and what would grow best on what land. Fertilization and irrigation was also important, and the land would often be fertilized with human "manure". Most of the chinampas have been abandoned and filled in - they weren't used as much after the conquest. When the Spanish arrived, the chinampas covered nearly 9000 hectares. However, some remain in use today. Remnants of the canal system can be seen in Xochimilco. You can still visit chinampas today if you take the time. The picture to the right shows someone boating on the chinampa canals. MSN's Encarta has this picture of farming through chinampas. Chinampas and other forms of Aztec agriculture actually come from the days before the Aztec empire. 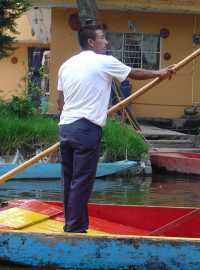 Chinampas farming was begun in Xochimilco and Chalco, and was probably quickly adapted by the Aztecs as these people became part of the empire. Aztec farming encompasses thousands of years of farming expertise.